Hertz (NYSE: HTZ) has a significant opportunity to continue to grow at a high rate driven by expansion into new markets — the non-airport rental market most importantly — and a cyclical recovery in the equipment rental business would add significant upside to FCF and earnings forecasts. Hertz Global Holdings is most known for its car rental business, but it also engages in equipment rental. The car rental segment rents and leases cars and light trucks and operates around the world. It tends to focus on rental locations near airports or central business districts. It also offers car sharing and used car sales. The equipment rental segment rents material handling, aerial work platforms, earthmoving equipment, generators, and other equipment largely for use in construction and industrial end markets. The car rental business generated $9 billion in sales over the last twelve months (LTM) with $5.5 billion related to airport-based rental locations and $3 billion off-airport. The equipment rental business generated $1.5 billion in LTM sales with $600 million from construction, $400 million from industrial, and $500 million from other fragmented markets. Sales are up 21% over the LTM at Hertz and pre-tax income by 39.4%. The car rental business has returned to peak levels and more than fully offset a more muted recovery in equipment rental. The equipment rental portion is still $272 million below its prior peak due to a slower rebound in construction. All this said, in terms of EBITDA, the equipment rental business contributed 32% of 3Q ’13 EBITDA. Management at Hertz sees an opportunity for double-digit growth in at least four of its businesses: its off-airport rental business, the vehicle leasing business, the leisure rental cars business — through its Dollar and Thrifty brands — and the equipment rental business driven by a recovery in non-residential construction and tuck-in acquisitions. The U.S. off-airport rental car market has annual sales of $11 billion, and Hertz currently has just a 14% market share. It believes it can accelerate its presence here by gaining market share in the insurance replacement market (loaner while getting repairs), where it has achieved double-digit growth in each of the past two years. It also plans to offer 24/7 rentals “in your neighborhood” and will add 300+ locations per year. At the end of 3Q ’13, Hertz had 2,710 locations compared to 1,580 in 2007. Also, Hertz is co-locating with body shops and hotels to gain share. Second, the off-airport business has lower infrastructure and other costs with 8% lower labor costs, 34% lower DOE, and 48% lower SG&A. A mix shift toward off-airport will improve margins and lead to a less cyclical business. Along these lines, fleet utilization averages 84.3%, 220 BPS higher than an airport location with longer average lengths of rentals. The company has a three-tier strategy in the U.S. and a similar one in Europe. It breaks the market into a premium, mid-tier, and value segment and has brands within each. In the U.S., Hertz is the premium brand with Dollar and Thrifty in the mid-tier, and Firefly as a value brand. The Avis Budget Group (NASDAQ: CAR) has Avis, then Budget, and Payless Car Rental, respectively. The premium market is growing at a two-year CAGR of just 3.4% and the mid-tier at 4.8%. However, the value segment is growing much faster at a 23.2% two-year CAGR but is just $500 million in size in the $11 billion car rental U.S. market. 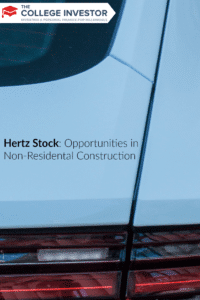 Acquisitions will also continue to play a critical role for Hertz. Over the past three years, it has realized $300 million in revenue and another $300 million in cost synergies. The company opened 143 corporate Thrifty locations in Europe over this time. While the residential market has started to recover, the U.S. non-residential business has lagged, but has started to show some signs of life and many forecast a 2014 recovery. The equipment rental segment is historically tied to construction, which accounted for 50% of peak sales, but just 39% of 3Q ’13 sales. In particular, non-residential construction is critical. While the business is smaller in terms of revenue, its EBITDA contribution was 54% at peak in 2007 and down but still important at 32% in 3Q ’13. The company has rationalized its fleet since the downturn and the fleet age is now 40.5 months versus 50.6 in 2Q ’11. Prices within this business also have turned and are up 15.3% the most recent quarter, while rental volume is up just 3%. Pricing (rental rates) is historically a key leading indicator in this market, along with utilization. It has also made 11 acquisitions since 2010 in this area at a cost of $240 million. The company has a CAGR of 52% since 2009 with pre-tax cash flow up 80% since the 2007 peak, despite equipment rental profits remaining 23% below prior peak. In 2012, Hertz generated $2.72 in CFO per share, steadily up from $1.69 in 2009. Growth in equipment rental and expansion within car rentals to non-airport-based locations should accelerate cash flows at a faster pace than the past four years. In addition, implementation of lean and a push toward a more asset-light model should also help. Management has forecast FCF of $550 million, up from $162 million as a result of these things. Hertz currently trades at a discount to its competitor Avis, despite better growth opportunities. With the equipment rental market showing more signs of life, and an expectation that non-residential construction improves in 2014, there is upside to FCF and EPS forecasts. In addition, the company can maintain strong growth driven by its push into off-airport rental locations and margin improvement opportunities. What are your thoughts on Hertz, and the growth of off-airport and equipment rentals? Editor’s Note: Like investment details? Check out some top investment blogs!